A Muslim Brotherhood leader in Jordan has been sentenced to 18 months in prison for criticising the United Arab Emirates. Zaki Bani Rushaid was found guilty of damaging relations with a foreign country. It was the first such case against a top opposition figure in Jordan for years. Rushaid had criticised the UAE, a key financial backer of Jordan, for its crackdown on the Muslim Brotherhood. 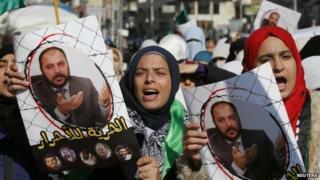 As deputy head of the Jordanian Muslim Brotherhood, he has been at the forefront of protests against the government. In November, he was arrested after writing that the UAE's rulers lacked legitimacy. His lawyer denounced the jail sentence as politically motivated, reported the Associated Press news agency, while rights groups also criticised his arrest. The Jordanian Muslim Brotherhood has substantial grassroots popularity and is the country's main opposition organisation. However, branches of the group in Egypt and Saudi Arabia have been banned. In recent months Jordan has been engaged in a crackdown on suspected supporters of Islamic State (IS), which has seized swathes of neighbouring Syria and Iraq over the past year. The government intensified air strikes against IS after the group released a video earlier this month showing a Jordanian pilot being burned alive.